Two calculations are imperative to the mediumwave DXer. 1. Sunrise/sunset time for the distant station. Signal enhancement occurs during sunrise and sunset times, both at the home location and the distant location. Seasoned DXers know this. Knowing when to listen is all-important. But when is sunrise and sunset at the distant station? Latitude and longitude for the station must be known for the calculation. These are available from the FCC database in a previous post, and other locations on the web. Also, and obviously, you must know the time of year: day and month, since sunrise and sunset times change day by day. 2. Distance to the received station. Sometimes more an interesting statistic than anything else, distance helps somewhat in judging how good the DX is, and makes for an interesting fact in the station log. Again, latitude and longitude for the station must be known for the calculation as well as your own latitude and longitude. So, how can we calculate these? Luckily, both can be had freely on the web. If you get into field strength calculations (see my series on this), you need a distance calculator that also returns the bearing of one latitude-longitude to another. The FCC has a great one. Distance can be calculated in statute miles, kilometers, or nautical miles. Two factors weigh heavily in DXing MW stations: think "Greyline" and "Solar Kp-Index". In the graphic, check out the time period on September 18 from 0600 - 1200 UTC. A very low Kp-index. Conditions were great. These data are made available through the cooperation of the Geological Survey of Canada (GSC) and the US Geological Survey. Now, how about that Greyline? The line that separates day and night is called the terminator. It is also referred to as the "grey line" and the "twilight zone." It is a fuzzy line due to our atmosphere bending sunlight, separating day and night, and usually lasts some 30 to 45 minutes after sunset or before sunrise. 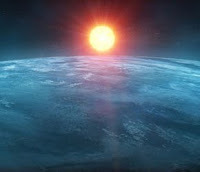 Stations or receivers at sunrise or sunset and in the terminator zone will exhibit enhanced propagation characteristics through the nighttime path. It's easy to know when we ourselves are in this zone, harder to know when the distant station is. Use the sunrise/sunset calculator to figure the sunrise/sunset times for the station of interest. Watch for the "pipeline effect". That is when both you and the distant station are in the greyline - you have continuous greyline between you. Signals can be greatly enhanced during these times. More information can be had about the greyline on the wikipedia.org web site. And now for a program plug. DX Atlas, a program developed for amateur radio operators, has a wonderful mapping ability to display the current greyline for your location, or for any other time of year. This program by Alex Shovkoplyas, VE3NEA, is outstanding. It even has the ability to create ionospheric maps, useful for the shortwave spectrum. DX Atlas is shareware, and requires registration and purchase after 30 days.